Steel Wraps provided by Warehouse Partners are a steel formed band solution for columns to mezzanine floors – home/shopping environments. A slim banded solution to hold pedestrians, pick dollys, shopping trolleys and rolling cages off columns. A double band to the floor level can be provided to take impact from hand pallet trucks. 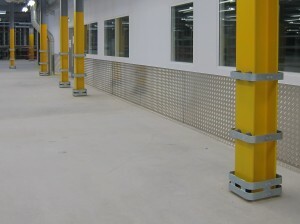 Drilled & bolted to columns and fitted with unique cone rubber absorbers to cushion impact as well as a robust quality look and feel to your warehouse environments without taking up too much space.